The Seevers Family Blog: Yet Another Purple Grand Champion! After being disqualified for cantering in the Walk/Trot Pole Bending class, Gracie recovers and takes a Purple Grand Champion in the Walk/Trot Barrel class! For those of you unfamiliar with 4-H scoring, purple is the top ribbon, blue is second, red is third and white is fourth. Grand Champion is "1st place" in the class and Reserve Champion is "2nd place" in the class. 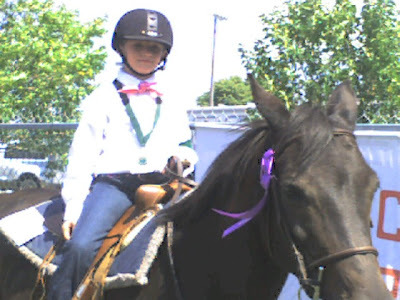 So, more than one child can receive a purple, but there is only one Grand and Reserve Champion. Yesterday, the judge ruled that Gracie could not compete in the Western Games in English tack (we were originally told she could) so last night we had to quick fit Shadow to a western saddle as well as make a late night Walmart run to buy Gracie a long sleeved white shirt, dark blue jeans and a black belt! Don't worry Marti, the judge let her ride in her English bridle so Shadow hardly knew any difference!